The first ever autonomous helicopter-drone hybrid firefighter was announced by a robotics firm at the GITEX Technology firm. Digi Robotics signed a memorandum of understanding with the Dubai Civil Defense to work on the new technology, which can be a first responder at a fire scene in the future. 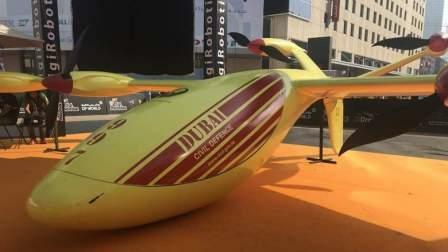 A prototype of the technology was on display at the exhibition in Dubai World Trade Centre on Tuesday. There will be three ways to fly this device, either with a pilot, autonomously and by controlling it through a control room. "The drone-helicopter hybrid has six engines and six propellers. Four of the engines will be turned off during in-flight to save power consumption. There are also several safety features installed, in case a pilot is flying it, for example, the parachute system. It will automatically activate if it is needed," the senior project director at Digi Robotics, Kollina Hanskehian, said. "In a mutual collaboration between Digi robotics and the Dubai Civil Defense, we came up with an idea to use Gitex as a launching platform for our mutual projects together." The body of the hybrid firefighter is made out of carbon fiber to ensure that lightweight material is used. Hanskehian said that they came up with this idea to help fight fires in a more efficient manner. "As you can see in Dubai there are high rise buildings. This drone could be fighting the fire until the defense team reaches. It will be using foam to fight the fire. "The drone is equipped with most leading technology and sensors in addition to the software, built in house to be the joystick for such a technology. "There are three ways to control the drone. One of them creates more safety for the firefighter because if a scene is too dangerous to go into, the drone can fly near to it and the pilot can control the drone from the control room." The Dubai Civil Defense already has a wide range of technologies that they use which helps in fighting fires more efficiently. They use drones to monitor a situation that is too risky for a firefighter to go into or an area that would be difficult for a human to access. Firefighters in Dubai are also known to use water jetpacks to fight fires, which a device that helps tackle flames on boats or cars that are on bridges above water.